Ukiyo-e, or ‘pictures of the floating world’, is a familiar term even in the English language. Conjuring nostalgic images of traditional Japan, ukiyo-e prints have long been cherished outside of Japan in the West by enthusiasts since the late 19th century. However their production, distribution and domestic market history is perhaps less well known. 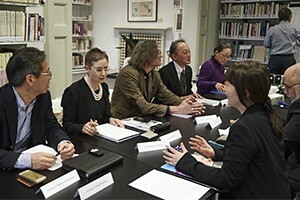 As part of the academic exchange initiatives between the Sainsbury Institute and Chuo University’s Faculty of Letters, one of Japan’s major comprehensive universities, a one-day academic workshop was held on Friday 10 April 2015 to discuss the ukiyo-e industry in the Edo period. 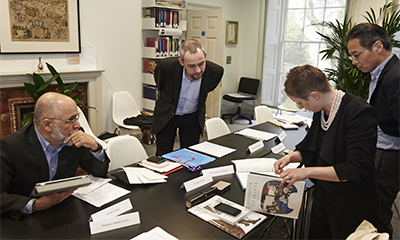 From Japan, US, Europe, and UK, scholars gathered in Norwich to share, explore and investigate new research finding on the demand, types and distribution routes of ukiyo-e during the Edo period. On the day, the workshop’s keynote speaker Professor Suzuki Toshiyuki began the discussion with a remarkable overview of the economic history of ukiyo-e in Edo-period Japan. Highlighting the influence of Edo as the capital city with one of the highest population density and literacy rate in the world at the time, he noted that there was a sharp rise in the number of small print sellers called ezōshi ya from around the late 18th century who specialised in selling ukiyo-e. In Kamigata (present day Osaka region) some 500 kilometres west of Edo, records show that there were a growing number of wholesalers selling Edo printed ukiyo-e to suggest the existence of a healthy growing market even outside of Edo and that there were stable distribution routes to help increase production rate and allow the market to flourish. That is, how what were once goods limited to Edo city became a huge nationwide commercial success. The profitability yielded benefits beyond the print sellers. Block carvers and printers were much in demand and were able to form more formal groups to secure a stable labour structure. Artist studios, such as the Utagawa school which emphasised traditional teacher-to-disciple relationship, were also able to expand their activities in the print area. By the end of the Edo period, shops specialising in selling nishiki-e and ezōshi-e were aplenty nation wide. So much so that trying to find a regional merchant that did not stock Edo printed ezōshi was virtually impossible! Dr Ellis Tinios from Leeds University gave a paper on how the Japanese adapted Chinese books for its own domestic audience. Rather than producing exact facsimiles, Ellis noted that Edo-period publishers ‘adapted the physical, textual and visual elements of the originals to conform to Japanese preferences’. This flexibility allowed them to meet the demands of an avid book-buying public with books in accessible user-friendly formats. Other speakers included Christian Dunekl from the Berlin Library who spoke on maps of famous sites, Dr Laura Moretti from Cambridge University on ephemera kobanzuke prints, Miss Matsumura Masako from Hiraki Ukiyo-e Museum on a type of specially commissioned surimono prints, and Professor Matthi Forrer from Rijksmuseum voor Volkenkunde, Leiden on the significance of illustrated books within the print industry. The workshop also welcomed Professor Ronald Toby, who could not physically attend but instead presented his insightful and intriguing paper via Skype on the depictions of Koreans and Korean envoys in pre-modern Japan. Professor Richard Bowring, who had the onerous duty of chairing the final discussion session at the end of a rich and diverse topic filled day, attempted to visualise the motivation of Edo period printing culture. Beginning with the question on why we make books and prints, he made a scatter plot chart to see if there were any remarkable correlations between print types (image based, image and text based, text based categories) and motivation from a producer’s point of view (financial gain, dissemination of information/education, promote political views, and self-expression), and readers’ point of view (desire for amusement, information, current trends and fashion, etc.). 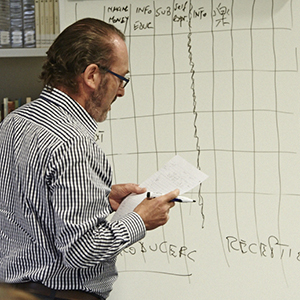 Lively discussions ensued, and while the typology was difficult to draw out, the exercise offered scope for further academic investigation. Mami Mizutori, Executive Director of the Institute, and her Chuo project partner Prof Wakabayashi Shigenori, together with Prof Suzuki are now moving ahead with the workshop proceedings production. The proceedings in Japanese edited by Professor Suzuki Toshiyuki and published by Bensei publishing will include papers from all presenters. While we begin work on the book production, for those interested in finding out more about the papers delivered, presenter bios and abstracts are available from here.